We had a great time at Relay for Life. Our team met and surpassed our fund-raising goal for this year. We also left the event excited about next year. I sold a few of my little quilts along with one that I brought to decorate our shelter. We chose a patriotic theme for our space and I brought along my little flag quilt. I made it after 9/11 as a sort of therapy for me. It did its job and as I haven't displayed it in my home for several years when someone asked it was for sale I said sure. I actually had three people interested in it so if I had had more I probably would have sold them too. Maybe I will have to make some more. I came home on Saturday to my husband tearing off part of the garage roof. On Sunday I took advantage of the beautiful weather and got the mowing done and on Monday I cleaned up the mess that my husband made pulling off old roofing and rotten wood. I did get back in the sewing room yesterday and got the labels on the baby quilt I made a week or so ago and on the t-shirt quilt. I also made some more blocks for this quilt and got it put together and quilted. 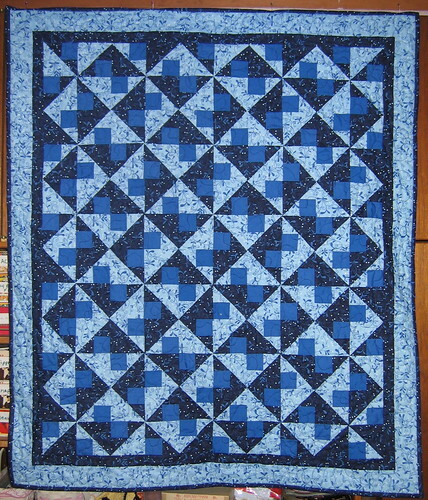 I finished the binding last night so I have another quilt I can sell. 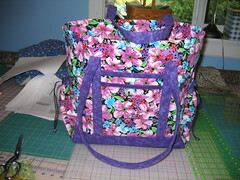 I also cut out another tote bag and had it ready to sew today. And I did just that! This one is for my friend and she wanted something with pink, purple and bright blue. I hope she likes it tomorrow when she comes over to get it. My next project to finish in the sewing room are the pillows to go with the window seat cushions I made for another friend. I got one pillow finished today and hope to get at least one more done tomorrow. Then I will need to make a trip to JoAnn's to get at least one more pillow form so I can make some more. I also have been asked to repair a 7-yr old's favorite quilt. It is well-loved and I hope I can give her a few more years with it. Also on my list of to-dos is my granddaughter's 'Big Girl' quilt. It needs to be ready for her birthday just after the 4th of July.